Society of Singers Night, 3 December 1990. A truly magnificent night in the history, though not known by a lot of people. Sinatra was awarded with the Ella award by Society of Singers, but more importantly, legends of music joined this evening to honor Frank Sinatra and sing for him. Those were the singers from the big band era, from different orchestras. 50 years before this night, in the early 1940’s, Sinatra and Connie Haines and Jo Stafford had sung together, and this night, both honored him with singing the same songs. It is not common experience for a singer to relive those 50 year old memories, and it is just beautiful. And while you might expect these legends to perform not well at the age of 65 or 75, even 94 year old George Burns is ready to surprise you. Henry Mancini: The 1940’s was known as the era of the big bands. Dorsey, James, Miller, Basie, Ellington, big bands, live music. They also produced a special kind of vocalist. No tricks, no electronics, just singers. Singers who stood in front of the big bands. Recently, a group known as the Society of Singers gathered at the Beverly Hilton Hotel. The event honored one of their own, Frank Sinatra, and the 60 years of music and entertainment he has given people all over the world. The Society of Singers is formed of a popular artist of today, as well as the legendary performers from the era of big bands. They came together on this evening to perform their greatest hits as they honored the chairman of the board. Ginny Mancini: To celebrate our engagement, we went to the Empire Room of Waldorf Astoria to hear a young singer named Frank Sinatra. He entered from the back of the room to an Axel Stordahl intro with a cup and a saucer in his hand and came in to sing “they’ve got awful lot of coffee in Brazil”, followed by a stunning rendition of Kurt Weill’s “Lost In the stars”, little stars, big stars, blowing the night and we’re lost hearing the stars. Well of course you see, Mr. Wonderful and I were experiencing the wonder of young love, and so you see how Frank Sinatra came in to play, and the memory lingers on… Tonight we honor the Pied Piper Frank Sinatra, with an award inaugurated last year in the name of Ella Fitzgerald. That says something about the integrity for which it stands. After Ella Fitzgerald sings “There Will Never Be Another You”, Frank Sinatra comes to stage with his grandchildren A.J Lambert and her sister Amanda Lambert, to receive his award. Frank Sinatra: I love you! Ella Fitzgerald: I love you too for many years! Frank Sinatra: No mine longer than yours tho. Frank Sinatra: Yea yea, I am older! Ella Fitzgerald: Ladies and Gentlemen, what can I say, what can we say about this great wonderful man who has brought so much pleasure in his music to you, but to say we love him. I love you, they love you, and I love you, we just keep on saying we love you. 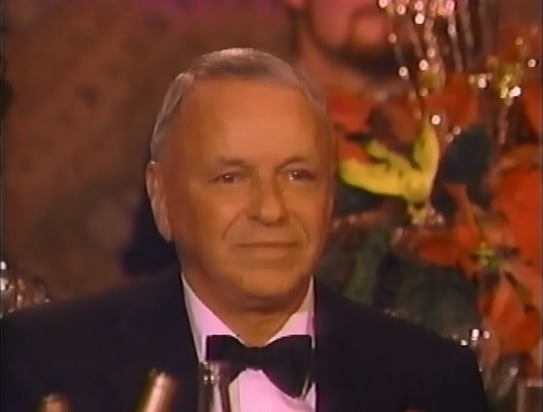 And Frank Sinatra receives his lifetime achievement award from Society Of Singers. Frank Sinatra: I have been honored in my lifetime, twice. First time by the police department of Hoboken New Jersey, and a few days later my old man took care of the job. But, it is difficult to find words to tell you how much I appreciate what you’ve done, all of you, for the organization, which I am very proud to be part of; and to be in this part of the show business, the singing end of show business and I mean I just put (Gene) Kelly down so many times dancing I thought I better stay with singing because it was embarrassing, you know what I mean? I felt badly for him at the time. After the beautiful duet, Jack Jones sings a version of the song “I am a singer” written by Gerard Kenny, lyrics of which was changed to personalize Frank Sinatra for this special Society Of Singers event. When the lyrics hit “He is Sinatra, he sings us songs, he brings the words to life, and he keeps the beat where it belongs”, Frank Sinatra gets very emotional and tears fill his eyes. After these moments, Jack Jones introduces George Burns. Jack Jones: Ladies and Gentlemen, no show about singers would be complete without a performance for one of the truly great vocal artists, the silver throat of Nathan Birnbaum ladies and gentlemen. George Burns: Thank you for the standing ovation. Look, if I can stand, you can stand. Frank Sinatra recorded Young At Heart years ago and sold millions and millions and millions. That’s the song I’m gonna sing tonight. At my age you can follow anybody. And we hear George Burns sing “Young At Heart”, at the age of 94! During the song, George Burns says: You know, I’ve been around for a lot of years, and there’s one thing I believe, and it works for me, and it’ll work for you too. You can’t help getting older, but you don’t have to get old. And Jo Stafford, Frank Sinatra’s friend from Tommy Dorsey era, and a member of Pied Pipers of Tommy Dorsey orchestra, comes to stage to sing “I’ll never smile again”. An amazing moment, just like in 1940’s; and we realize that 50 years were not enough to change anything. When you think of it, it is just amazing to see all these legends at Society Of Singers night because it just seems impossible to gather all the legends after 50 years. After Jo Stafford, Tony Bennett is on the stage. Tony Bennett: Oh boy, what a beautiful night, what a magnificent night. I’ve seen many shows in my life but this is the greatest audience and the greatest performers I’ve ever seen. Frank Sinatra asked me to sing this song and I love it. It is a magnificent, wonderful song. Then Manhattan Transfer and Connie Haines sing “Snootie Little Cutie”, full of life. A special part of the Society Of Singers show awaits us after this great performance, and Peggy Lee shares her memories and sings a song for Sinatra. Peggy Lee: Hello Frank. I have so many memories, and Barbara, you simply must forgive me; I’ve been in love with that mean all the years I’ve known him. But it’s OK, it’s platonic, I think… I think about those things, you know, one day we built a home. You built yours and I built mine upon a hill, and a lot of wonderful things happened there. I even remember the firecrackers you used to set off about three or something in the morning. First it frightened me but then I realized it was Francis Albert up there. With Jimmy Van Heusen and all the gang. And, we had barbecues, well we had one barbecue I remember, and all those dear things, so many… And a special version of “The Man I Love” starts, for Frank Sinatra. So emotional, so beautiful. A moment captured in time, reminding us that the world is full of beauties, and nostalgia is a powerful feeling that strike our hearts. And with these videos, it is timeless, it is immortal. Just after that, Tony Danza and Gretchen Wyler perform a dance show and Herb Jeffries sings Flamingo. Tony Martin follows them with a perfect performance of “There’s No Tomorrow – O Sole Mio”. Frances Langford introduces the ladies that sang with the big bands and a marvelous sequence of performances start. Kay Starr sings “What a difference a day makes” and it is unbelievably amazing. At the age of 68, her voice and how good she looks while singing is wonderful. Helen Forrest, 73 years old, sings “I Had the Craziest Dream”, again an outstanding performance. Martha Tilton sings “And the Angels Sing”. And we hear Bea Wain perform “Deep Purple”. Kitty Kallen, before starting to sing, says “Will you help me? I am scared to death” and sings “It’s been a long, long time”, beloved by everyone in the room. Fran Warren sings “I Want a Sunday Kind of Love”, with a very strong voice. And lastly, The Sentimentalists sing “On the Sunny Side of the Street”, followed by Joe Williams performing “Alright, Okay, You Win”. After these, another special part starts, where Eydie Gorme and Stewe Lawrence sings songs written by Frank Sinatra. Stewe Lawrence: For many years, Frank Sinatra has received many awards for his artistic achievements as a singer, as a performer and as an actor. But there is another creative side of Frank that is generally now too well known. Now besides singing a lot of great songs, he also wrote quite a few of them. And, this evening Eydie and I selected a couple of our favorites composed by Francis Albert, and ladies and gentlemen, we’d like to celebrate Sinatra the Songwriter. Eydie Gorme sings “This Love Of Mine” and Stewe Lawrence sings “I’m A Fool To Want You”, which is performed beautifully. It is not common for this song to be performed live, with Sinatra in the same room, which makes it more special. This beautiful night by Society Of Singers ends with all people singing “Dream” first, then Sinatra takes the microphone. Frank Sinatra: May I thank you, fellow singers and performers. I love you. I am kinda hung up a little bit with my throat so I won’t say too much, but it was a marvelous evening tonight. I had a great time tonight, I really did. 2014 Mike Love, 2011 Smokey Robinson, 2010 Natalie Cole, 2009 Herb Alpert & Lani Hall, 2008 Andy Williams, 2007 Gladys Knight, 2006 Johnny Mathis, 2005 Elton John, 2004 Celine Dion, 2003 Barry Manilow, 2002 Placido Domingo, 2001 Julie Andrews, 2000 Tony Bennett, 1999 Joe Williams, 1998 Rosemary Clooney, 1997 Lena Horne, 1995 Steve Lawrence & Eydie Gorme, 1994 Peggy Lee, 1992 Tony Martin, 1990 Frank Sinatra, 1989 Ella Fitzgerald. And on the youtube page of Society of Singers, there are some short videos from certain nights you might find interesting. And on the shop page of Society of Singers website, you can purchase items to support the Society of Singers group and help their cause.